The name means ‘Ford of the White Cairn’. This was probably the property recorded in 1391 as “Retyrymlad” – perhaps implying that a battle was once fought here. (Battle of St. Dogmaels – 1091?). A document of 1573 mentions “Ryde y garnewenne”, as three acres of land between Rhydgarnwen and Croesyfran, St. Dogmaels, were released on 7th May 1573 by the owner of Rhydgarnwen – William Gruffydd ap Jenkin of Llantood. In 1600 George Owen referred to”…Rhyd y garn wen…in ancient deeds called Rhyd r ymladd…” His hypothesis is conjectural. On 19th June 1657 Rowland Jenkins of Bayvil, in his will, left land called “Rhyd y Garne” in Llantood to his sons – James and Owen Jenkins. In 1729 reference was made to “Rheed y Gaer Wen”. In the C17 and C18, the Morgan family lived here. John Morgan married Elizabeth Lloyd, daughter of John Lloyd (d.1638) of Hendre, St. Dogmaels, and had a son, George Morgan, who married Joan Jones, daughter of Jenkin Jones of Cardigan. Their son and heir, John Morgan, married Mary Rowland, daughter of William Rowland of Cilgarthen, St. Dogmaels. They had two sons, George and David Morgan, and two daughters, Jane and Joan Morgan, all living at Rhydgarnwen in 1733. David Morgan married a daughter of George Lloyd of Cwmgloyne and had issue by 1755. In 1786-88 the property was owned by William James and leased to David Richard, tenant. 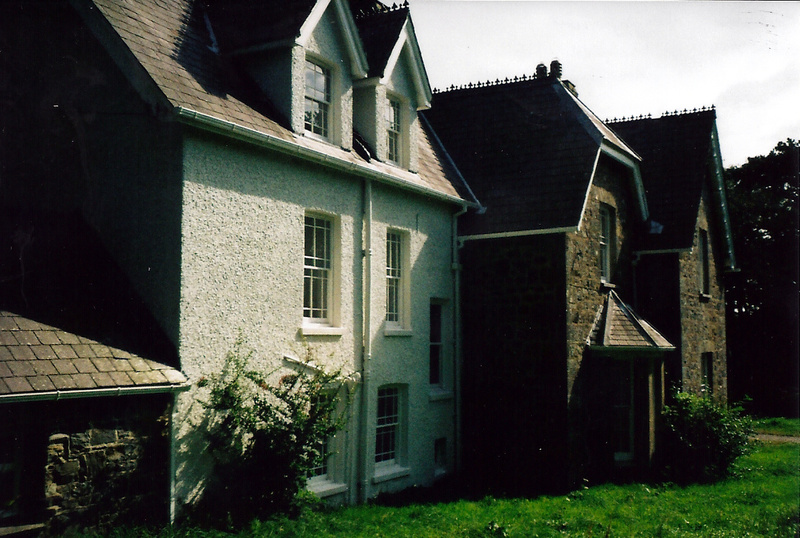 In 1790-91 William James leased Rhydgarnwen to Mary Richard. In 1793-94 William James was the owner and occupier. In 1796-97 Thomas James was the owner and occupier. In 1801-03 William James was the owner and occupier. In 1808-48 Thomas James lived here. On 31st January 1814 John James, son of gentleman farmer Thomas James and his wife, Margaret James, of Rhydgarnwen, was baptised at Llantood Church. On 26th November 1815 Maria James, daughter of Thomas & Margaret James, was baptised at Llantood church as was their daughter, Mary James, on 25th October 1818 and son Llewellin Francis James on 15th January 1824. In 1825 Thomas James was a shareholder in the 85 ton Cardigan ship ‘Eagle’. In 1838 the cottage here was owned and occupied by Thomas James. On 21st January 1839 John James, son of Thomas James, died aged 25. In 1841 the following persons lived here: Thomas James, 65; Margaret James, 55, his wife; William James, 30, their son; Mariah James, 25, daughter; Mary James, 20; and six servants. Thomas James died on 27th March 1848 aged 72. In 1848-61 William James lived here. In 1851 the following persons lived here: William James, 41; farmer of 190 acres; Elizabeth James, 40, his wife; Thomas James, 7 months, their son; and five servants – Mary Davies, 22; Ann Davies, 26; Hetty Phillips, 15; Benjamin Jones, 20; and David Thomas, 17. In 1861 the following persons lived here: William James, 50, farmer of 120 acres; Elizabeth James, 50, his wife; Thomas James, 10, their son; Anne James, 6, their daughter; and Mary Evans, 16, house servant. In 1867 reference was made to John George of Llantood – perhaps living here? William James had died by that date, and his widow, Margaret James, died at nearby Croft House on 21st September 1868 aged 86. William James, her son, formerly of Rhydgarnwen, died in December 1868 aged 64. In 1871-90 William Griffith George, solicitor, lived here. In 1871-1934 John Picton Meredith George lived here. In 1871 the property was the home of the following persons: William Griffith George, 49; Eliza George, 46, his wife; Eliza G. George, 21, their daughter; John Picton Meredith George, 17, son; and five servants – David Evan, 57, agricultural labourer; Joseph Charles, 23, farm servant; Mary James, 24, house maid; Martha Williams, 22, dairy maid; and Letitia Mathias, 16, scullery maid. 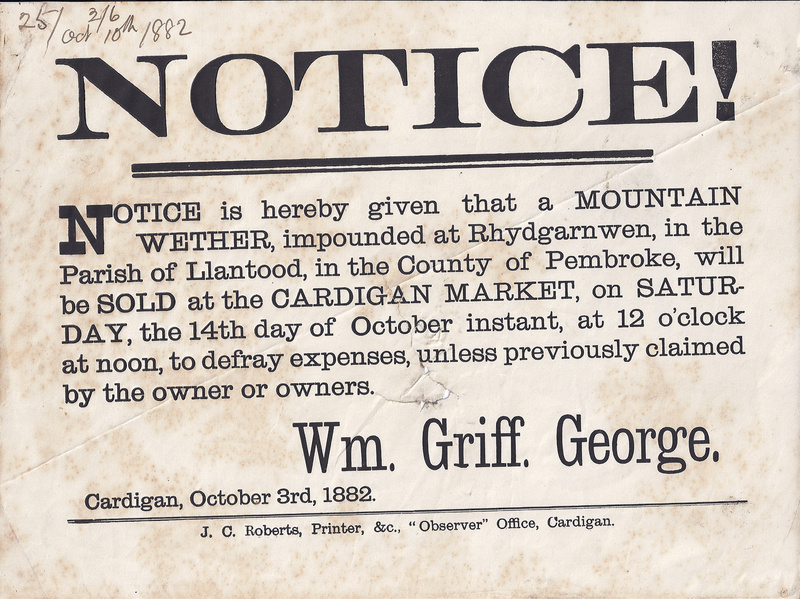 In 1873 William Griffith George, solicitor, owned Rhydgarnwen with 138 acres. On 1st January 1874 his second daughter, Lily (Elizabeth) George, married Rev. Isaac Thomas Hughes Jones, Vicar of Llanfihangel Penbedw, at Llantood Church. On 19th December 1878 Henry Llewelyn George, youngest son of William Griffith George, died aged 23. On 19th October 1880 John Picton Meredith George, Cardigan solicitor, married Miss Sarah Evans of Cidygyll. In 1881 John Picton Meredith George was the Under-Sheriff of Cardiganshire. In 1881 the following persons lived here: William Griffith George, 59, solicitor; Eliza George, 57, his wife; Blanche George, 29, their daughter; David Evans, 63, servant; David George, 14, servant; Sarah Davies, 23, dairy maid; and Hannah Bowen, 17, housemaid. 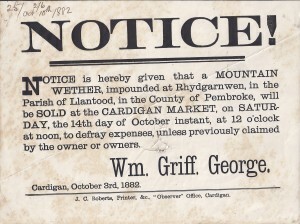 On 3rd October 1882 William Griffith George issued a poster, stating his intention to sell a “mountain wether” that had strayed onto his property, unless it was claimed by the owner. In 1883 William Griffith George was still clerk to the Cardigan Union. On 11th February 1884 Blanche George, daughter of William Griffith George, married David Davies, solicitor of Cardigan, at Llantood Church. On 12th February 1890 William Griffith George was buried at Bridell church, having died aged 68 on 7th February. In 1890 the house was rebuilt for John Picton Meredith George, designed by George Morgan of Cabankrmarthen, architect. In 1891 the following persons lived here: Eliza George, 67, independent; James Beddow, 38, servant; and Hannah Jones, 35, servant. On 25th March 1892 tenders were sought for building stables and outbuildings here designed by George Morgan for J. P. M. George. In March 1893 Mary Evans George was born here. In January 1894 Mrs. Sarah Evans George presented a new altar cloth to Llantood Church. On 26th March 1897 Mr. & Mrs. John Picton Meredith George, together with Mr. W. Phillips of Tredefaid, donated a set of 16 lamps to Llantood Church. In 1901 the following persons lived here: John Picton Meredith George, 47, solicitor (b. St. Dogmaels); Sarah Evans George, 44, his wife (b. Gloucester); Martha E. George, 19, their daughter (b. Llechryd); Gwladys E. George, 18, daughter (b. Llechryd); Caroline Evans George, 16, daughter (b. Bridell); Beatrice Evans George, 14, daughter (b. Bridell); Mary Evans George, 8, daughter; Mary Ann John, 34, cook (b. Capel Colman); and Ester Jenkins, 19, housemaid (b. Eglwyswrw). Mary E. George spoke only English – the rest of the household was bilingual. On 13th August 1903 Eliza George, widow of William Griffith George, died aged 80. On 5th September 1912 Albert Owen Webb-Potter of Bingham House, Cardigan, married Miss Beatrice Evans George, 4th daughter of Mr. & Mrs. John Picton Meredith George of Rhydgarnwen. On 18th November 1913 Tom Powell of Newcastle Emlyn married Miss Caroline Evans George, 3rd daughter of Mr. & Mrs. J. P. M. George of Rhydgarnwen. On 4th October 1915 Gwladys E. George, second daughter of Mr. & Mrs. J. P. M. George, married Edward Brocklebank Evans of Llandysul, solicitor. In November 1916 William George, only son of Mr. & Mrs. J. P. M. George of Rhydgarnwem, was in hospital, having been wounded in the Battle of the Somme. In October 1917 William George, son of Mr. & Mrs. J. P. M. George of Rhydgarnwen, was seriously injured about the face in Flanders. In May 1918 Corporal William George was badly gassed in France. On 8th December 1919 Richard Meredith Evans, son of Edward Brocklebank Evans and Gladys Evans of Rhydgarnwen and Cardigan, was baptised at Llantood Church. On 22nd November 1922 William George, only son of Mr. & Mrs. J. P. M. George of Rhydgarnwen, married Elsie Dyke of Herefordshire. On 19th October 1930 Mr. & Mrs. J. P. M. George celebrated their Golden Wedding Anniversary. On 8th January 1934 John Picton Meredith George died aged 80. In 1934-39 Mrs. Sarah Evans George lived here. J. P. M. George’s widow, Sarah Evans George, died on 2nd March 1939 aged 82. On 21st April 1939 Rhydgarnwen was advertised to let. On 31st May 1939 there was a clear-out sale here. In 1939 Martha Jenkins lived here. In June 1943 the Rhydgarnwen estate was advertised for sale. In July 1943 the property was sold. On 23rd May 1947 Mary Evans George, late of Rhydgarnwen, died aged 54. In 1950-57 Mrs. Mary Elizabeth Lewis, widow of Cardigan architect Lewis Lewis, lived here. In 1951 Mrs. Mary Elizabeth Lewis was the first female President of Cardigan Agricultural Show. In July 1957 Mrs. Mary Elizabeth Lewis, formerly of the ‘Black Lion Hotel’, Cardigan, died. On 11th & 12th September 1957 there was a sale of contents held here. On 14th December 1957 the estate was sold, including the 5-bedroom house here. On 15th August 1958 the 5-bedroom property was advertised for sale. It was up for sale again c.1969. In 1980 the house was sold again. It was advertised for sale in April 1988, as a guest house. The property became a listed building in 1994. “…EXTERIOR – Asymmetrical villa in tooled squared stone with slate eaves roofs, crested ridge tiles and fretted bargeboards. Stone stacks. Two storeys and attic. Sashes with marginal glazing bars and slate sills. Main S front has projecting half-hipped gable to right with ornate fretted bargeboards and outside E stack, two first floor windows with single sill, and big canted bay below with slate three-sided roof. Range to left is of one and a half storeys, the two upper windows breaking eaves under two bargeboarded stone dormer gables. Ground floor lean-to, hipped at W end with two windows to front and paired panelled doors with stained glass top-lights and stained glass to Gothic overlights. W end gable has fretted bargeboard, and window each floor. N side stone stack in valley to recessed half-hipped gable with canted bay below and window above. A two-bay two-storey-and-attic rear wing is roughcast with two dormers, stone ridge stack and brick N end stack. E side of main house has big outside chimney and NE steep roof hip over stair-light and door. A stone lean-to in angle to service wing has shouldered-headed door and small window above. Roughcast service wing has gable to left and two dormers, the gable floor levels higher than those to right. INTERIOR – Staircase to right of entrance hall, with Gothic newel and turned balusters. Fireplaces removed. Panelled doors, tiled floors. Stained glass bird panels in front doors.